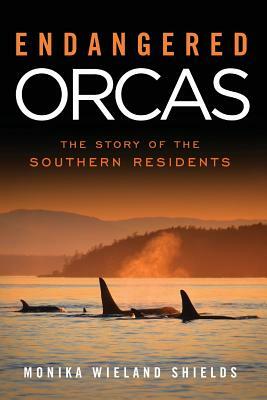 Orca Watcher: A gray whale in the San Juan Islands! This morning when I got down to the boat Captain Hobbes was sitting in the wheelhouse with his binoculars and said casually, "I'm watching a gray whale." I laughed and gave him a skeptical look, but I glanced out towards San Juan Channel and almost immediately saw a huge spout! Our trip got underway about half an hour later and we did indeed spend the first part of our morning with a gray whale. 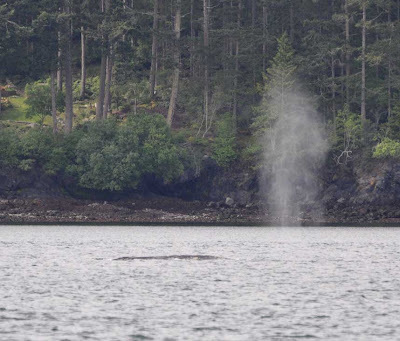 There are often gray whales down in Puget Sound in the spring, but they are a rarer sighting up in the San Juan Islands, so we were very excited today. Look at how high that spout goes! Interestingly, this gray whale also fluked a couple of a times. Normally that's a behavior associated with humpback whales right before a deep dive, but this whale did it a few times too, giving me a chance to get a photo of the underside of its tail flukes. I timed one of its longer dives at seven minutes. 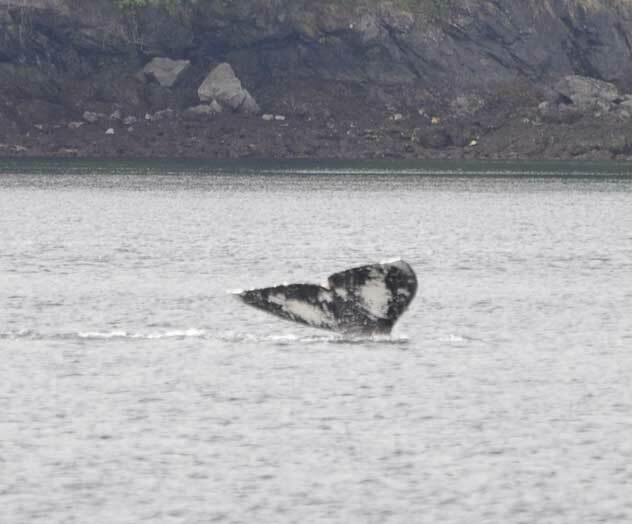 For our afternoon trip, we caught up with the gray whale again further north in Boundary Pass near Skipjack Island. I had to wonder if this whale was migrating through (kinda late?) towards Alaska, as I believe some gray whales do go up the Inside Passage. Other grays hang out off the Oregon and Washington coasts for the summer instead of making the full migration, but there's not many places for this benthic-feeding animal to forage in the deep, rocky channels of the San Juans. 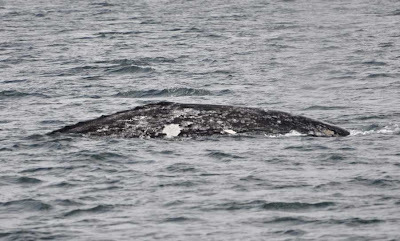 Gray whales can be identified by their tail fluke markings (if you are lucky enough to see them), or more commonly by the mottled white patterns on their side, as in the photo above. I compared this photo to the ID guide of northern Puget Sound gray whales put together by Cascadia Research, but didn't find any matches. I've sent a couple photos to some baleen whale researchers to see if they know who it is. It's interesting that we saw a gray whale today, because just the other day I was reading an amazing article about a gray whale spotted off of Israel. This is remarkable because the Atlantic population of gray whales has been believed extinct for about 300 years. 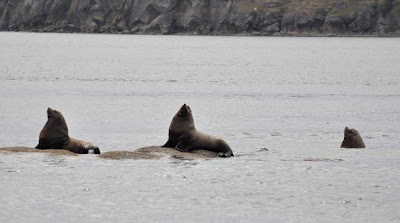 If it is a Pacific gray whale, how in the world did it find its way over there? It has definitely raised a lot of questions. 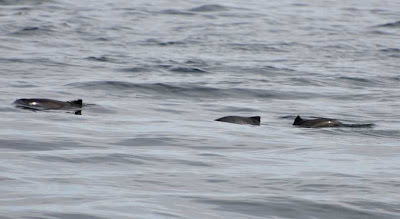 A little while after leaving the gray whale we found ourselves surrounded by dozens of harbor porpoise near Boiling Reef. It's pretty spectacular to just cut the engines and float in the currents while porpoise pop up all around you. Since they are small at about 4-5 feet long they surface quickly, so photographing them can be difficult. Today was the first time I managed to get as many as three in one shot! 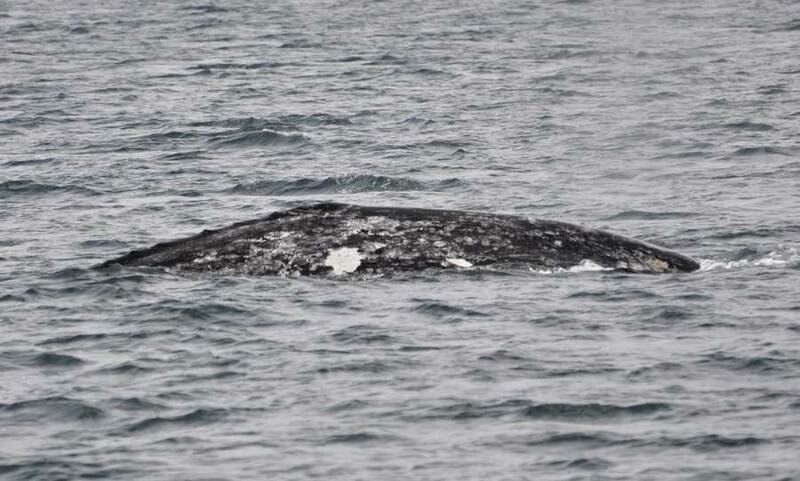 That is just bizarre - Grey Whale off the Israeli coast!!! How in the name of bejeepers did it get there? And more weirdly where did it come from? That's a lomh long way in to the Med for it not to have been noticed anywhere else...are there anymore in the Atlantic? Any whale would be a cool sighting for me. Congrats on the gray whale sighitng. I enjoyed your photos! Monika - seems my Patogonia theory was incorrect, shoulda read your comments before launching into the keyboard! Nice to see our local Uni getting a mention - think I mentioned this madcap proposal on one of my missives a while back - good on 'em - go for it guys!!!! The planet is changing, I suspect more unusual 'out of place' sightings will occurr in the next few years.